New Reports Question Whether CDC Contractor On Elevator With Obama Was Felon : The Two-Way Now unemployed, he tells The New York Times that what begun as one of the most remarkable days of his life turned into a "nightmare." 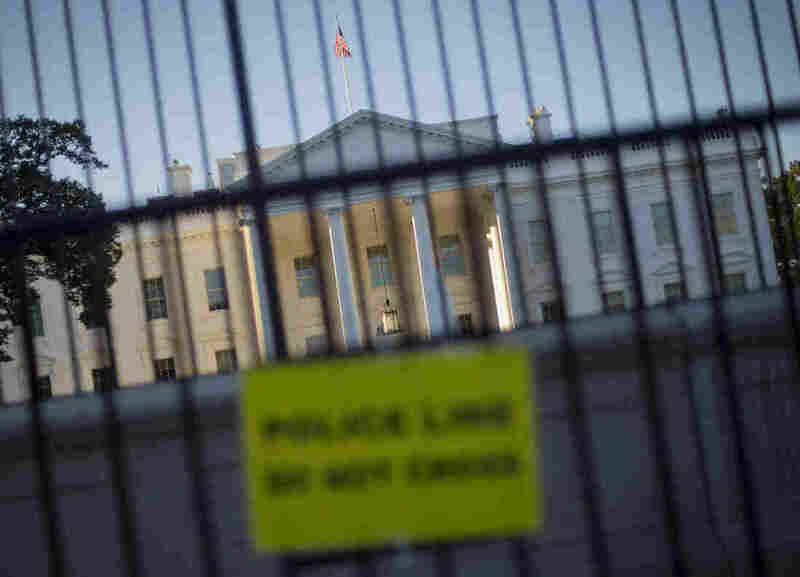 As an extra layer of protection, a perimeter fence has been placed in front of the White House fence on the North Lawn along Pennsylvania Avenue in Washington. What began as one of the most remarkable days of Kenneth Tate's life turned into a "nightmare." That's the story The New York Times is telling about the man the paper identifies as having ridden an elevator with President Obama with a gun in his holster. If you remember, Tate was thrown into a Washington firestorm over the efficacy of the Secret Service. Following an incident in which a man ran into the White House with a knife, media outlets — including NPR — reported that Secret Service agents allowed an armed security contractor with a criminal history to ride an elevator with Obama during his September visit to the Centers for Disease Control and Prevention in Atlanta. That revelation, coupled with others, led to the resignation of Secret Service Director Julia Pierson. But new reporting finds that Tate did not have a criminal history. According to The New York Times and The Washington Post, Tate has been arrested before. The Times reports he has been charged with robbery and assault, but he has never been convicted. Tate tells the Times that fateful day began like any other: He was given his weapon in the morning and then he was told he was going to operate the elevator President Obama would ride. That day, the president even struck up a polite conversation with Tate. When Obama was leaving, Tate said he snapped a few pictures of him getting into the limo. Secret Service agents became angry and eventually questioned him. "I was upset. I'm nervous because I'm like, I don't understand what's going on," he said. Mr. Tate said the images he had taken on his smartphone were of the limousine and the agents around it — similar to ones that news crews often take. He said the Secret Service had ordered him to delete them; he complied. After the Secret Service interview was completed, Mr. Tate's bosses took away his C.D.C. badge. The next week he was given his letter of termination. "Mr. Tate said the C.D.C. and the contractor still had not provided him with an explanation about why he was fired. Making matters worse, his 27-year-old son — who had worked at the C.D.C. as a contractor for seven years — was unexpectedly dismissed two weeks after the incident for 'downsizing' reasons, Mr. Tate said." The whole Times piece is worth a read, so we encourage you to click over.